A horse is one of the most loving animals and has been with humans for ages. It has fought wars alongside us, it has helped us grow our food, it has helped use travel across countries and it has been a friend in all both good and bad times. 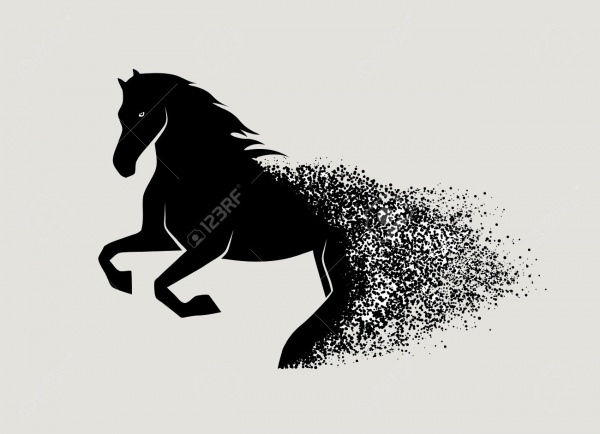 Consequently, a horse has come to symbolize a lot of things, commonly including love, devotion, endurance, stability, courage, wisdom, and elegance. 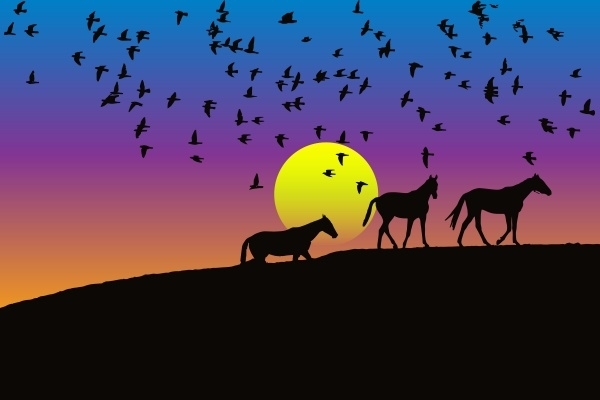 Well, if you are looking to integrate such symbolism in your own designs, here are some beautiful horse Free Vectors silhouettes to check out! 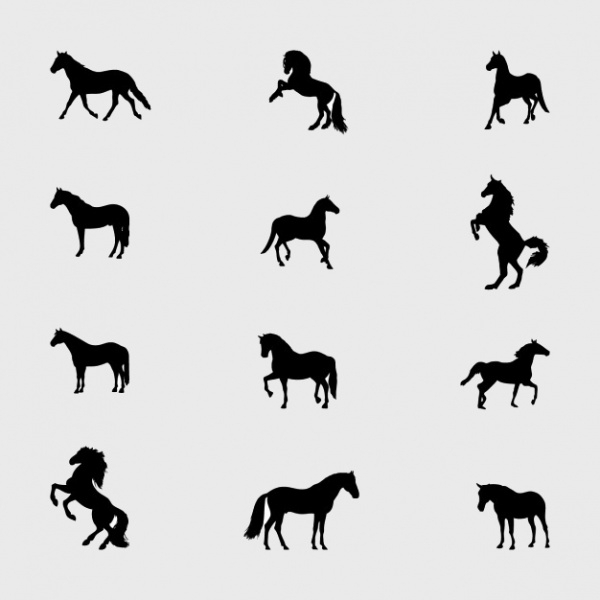 This set of horse Silhouettes Vector would be a great asset for any graphic designer. Created as vectors, the elegant and unique silhouettes are offered for free and are up for grab! If you have been looking for a standalone horse silhouettes representative of power and grace, this would be a great choice. The graphic is completely illustrative and can be a great integration in your Cool Logo Design. 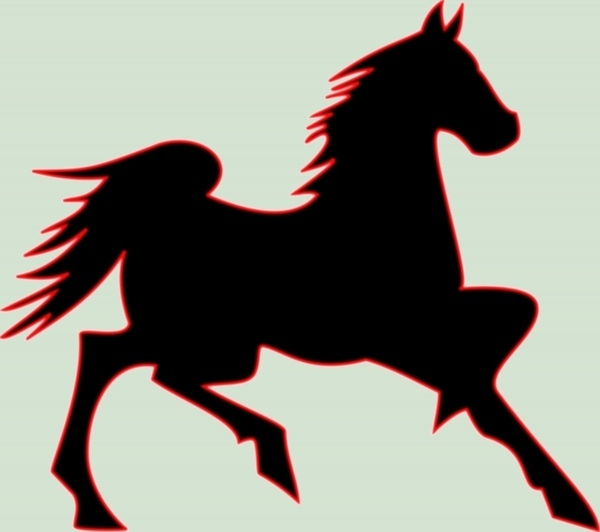 Another graceful silhouette of a running horse, the symbol here is about vigor, strength, and endurance. If such are the goals of your design, this would be a good choice. You may also see Dancing Girls Silhouettes. 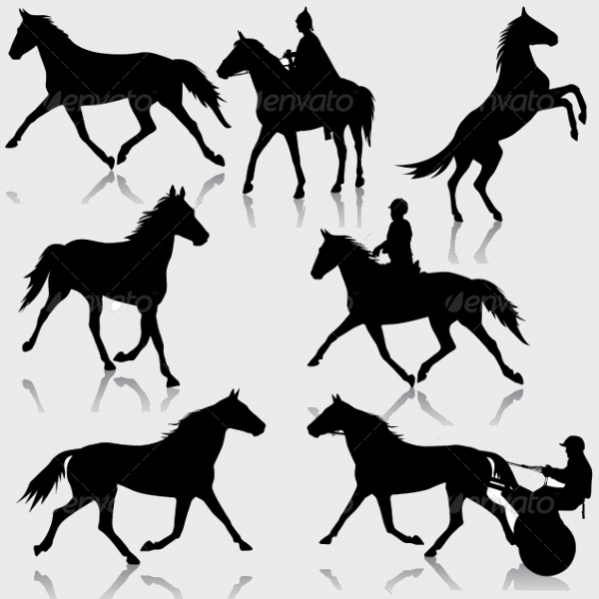 Now, this is supposed to be the most graceful portfolio set of horse silhouettes. Offered in high-resolution, the vectors will be perfect for any kind of logo, design or other applications. The word ‘mustang’ is enough to represent something really manly, powerful and graceful at the same time. 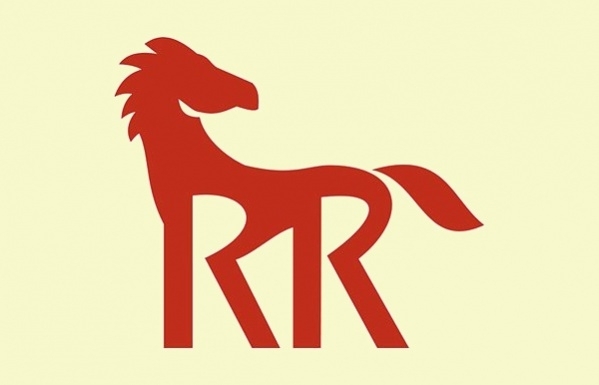 This is perfectly depicted by the red horse silhouettes here and will add charm to any design material. 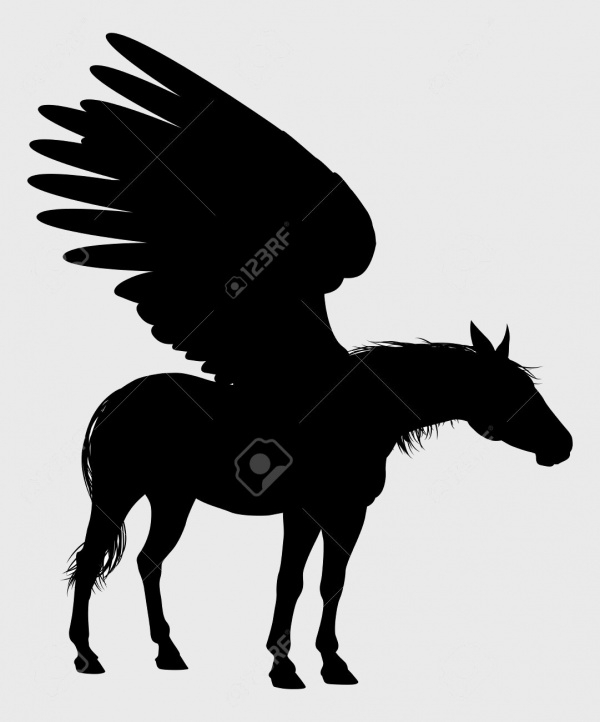 A flying horse inspires awe, grace and the charm of a creature that has been in every legend that man knows. If you are trying to achieve something similar, here are some vectors you can use. Horses are legendary creatures and have regularly found space in vintage designing, be it in graphic art or home décor. 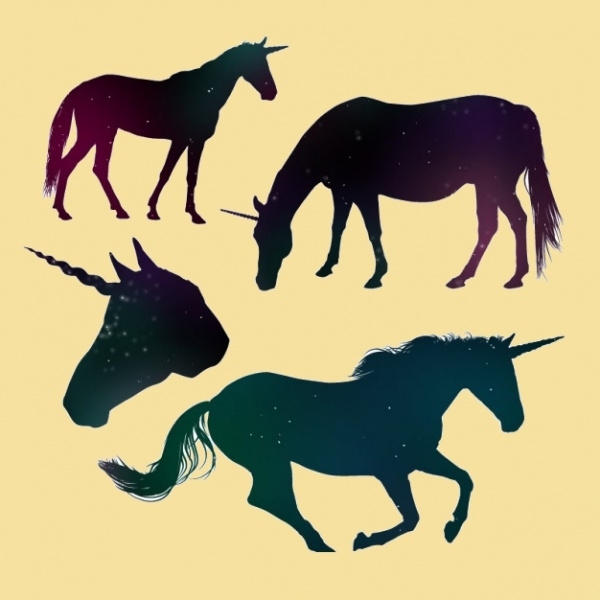 Check out these unique vintage horse silhouettes to add to your work. A standing horse is the most attentive animal stance that’s accompanied by grace and authority. 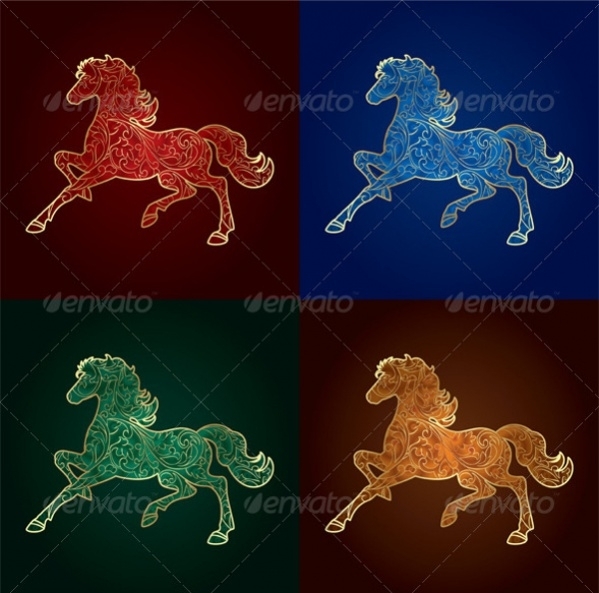 Here are some such standing horse vectors that can go into your graphic design work and increase its relevance. 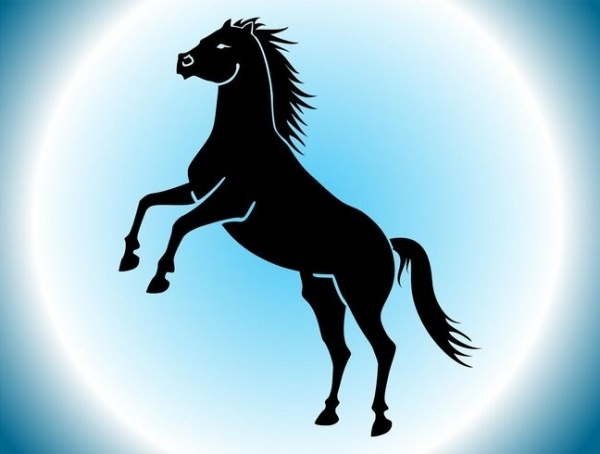 Horse silhouette is one of the most popular elements in graphic and logo designing. If your design work requires the same, you can check out these amazing vectors, offered for free. When horses run, they are the most fearsome, free and unbound creatures. 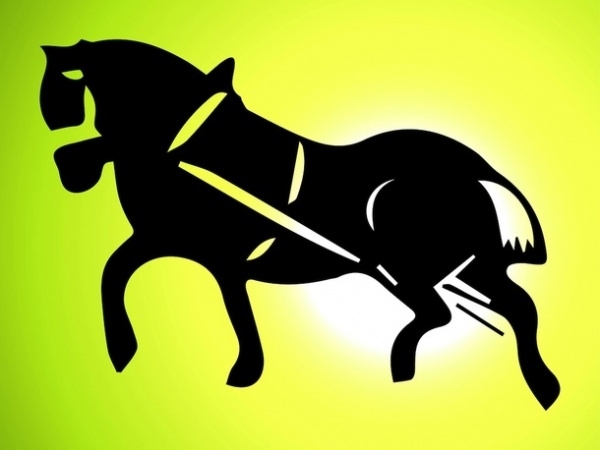 If your logo is all about showing this spirit, use these horse silhouettes to match the requirements. A horse standing in the middle of grassland and under a starry night sky is a moment that will get your spellbound. There’s a fancy charm to the depiction and it’s rightly represented in this silhouette vector. Are you designing something that requires showing how to jump hurdles? 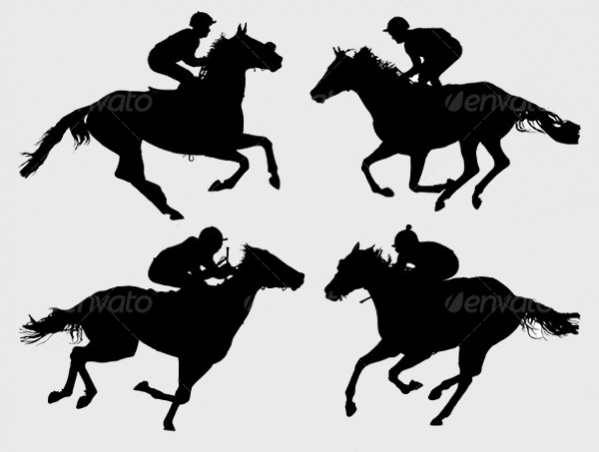 Be it for a sports event or a life lesson illustration, this jumping horse silhouette will be a great choice. 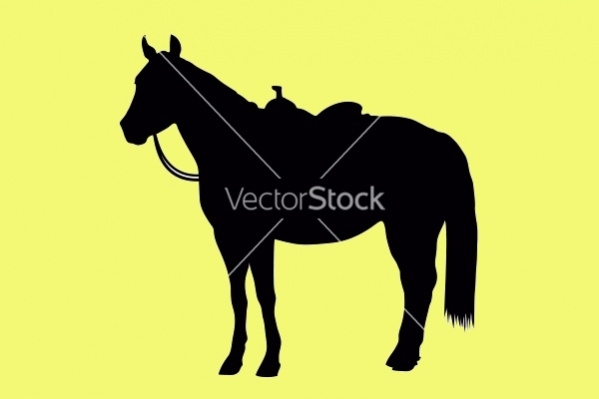 Grunge silhouette designs look amazing when it’s about a horse. This vector will suit a range of application, whether you are designing for a sports bar or a life counseling event. A rearing horse is a beautiful representation of persistence, courage, and hard work. This vector would be a great inclusion in any logo that is trying to communicate such characteristics. Ponies are smaller horses but nonetheless graceful. They are representative or hard work, humbleness, and determination. 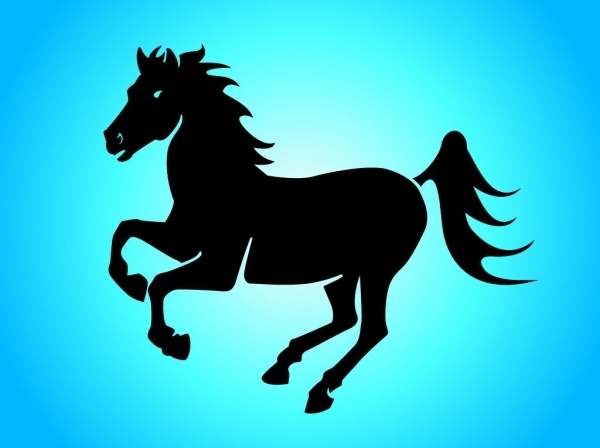 Use this horse silhouette symbol to mark these characteristics. 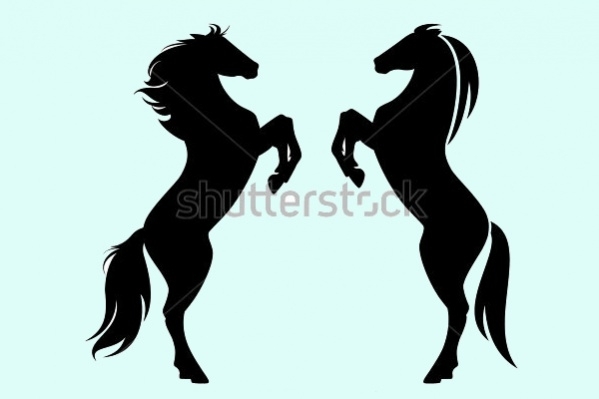 How to use these “Horse Silhouettes”? 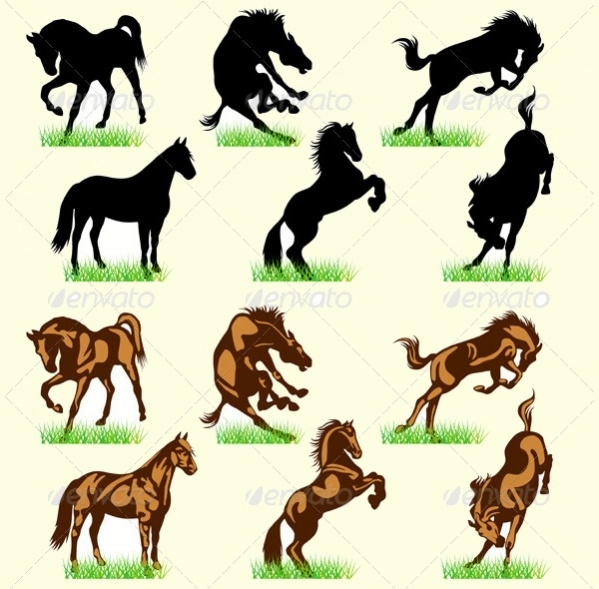 All the above horse silhouettes are offered as high-resolution vectors and come mostly in a black and white scheme. They are perfect logo elements for all kinds of businesses and organizations. Just download them and use them as standalone symbols or integrate them into your design to add relevance. Since the vectors come in very high resolutions, they can be put to all kinds of applications, ranging from web vector graphics to banner designs and window/car decals. Just make sure that the place they are put to evokes a similar personality as the creature in design. 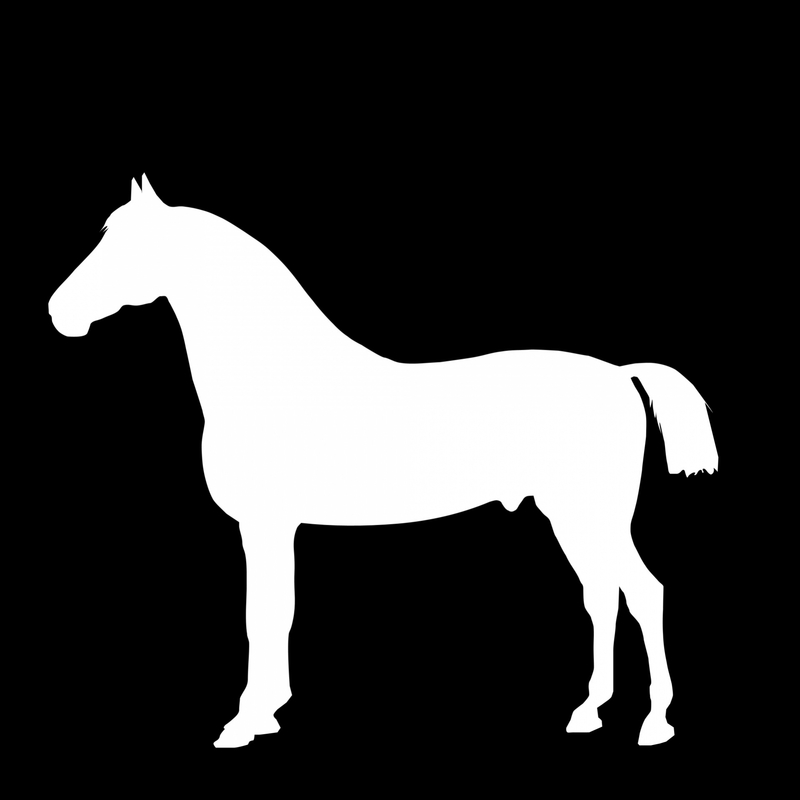 We hope that you have found the perfect horse silhouette for your design work. Do note that these vectors have been contributed by some of the most talented and creative graphic designers from across the globe. Further, many of these vectors are also offered for free while some attach a minimal fee for download.